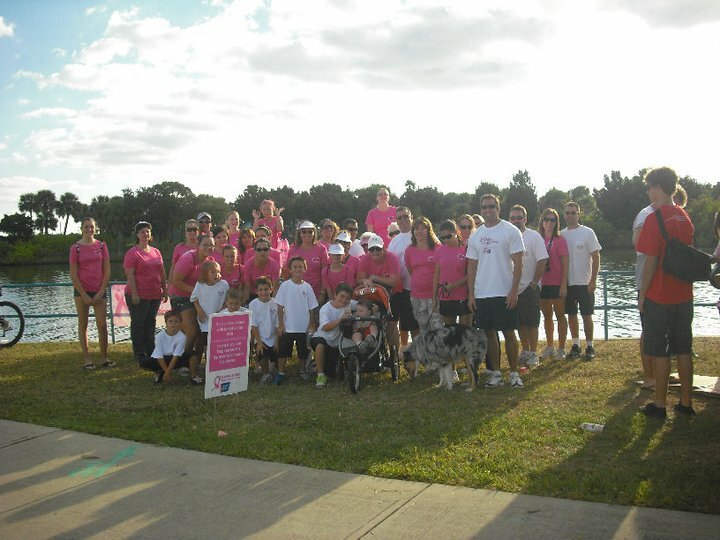 For almost a decade the Central Florida personal injury law firm has participated in Making Strides Against Breast Cancer by sponsoring a walking team and raising considerable contributions for the cause. The Volusia/Flagler walk is one of more than 270 such events in the United States held during breast cancer awareness month. The Volusia/Flagler Making Strides Against Breast Cancer Walk will be held Saturday October 27 at Jackie Robinson Ballpark in Daytona Beach. A local law firm is doing their part for the charity. For the last seven years, the Daytona Beach Law Firm of Politis & Matovina have made the walk their largest annual charity event. By raising funds for the walk, hosting a visitors’ tent, publicly thanking participants and business partners, and, of course, walking in the 5K event, Politis & Matovina are high-profile and passionate supporters in the fight against breast cancer. For almost a decade the personal injury law firm has participated in Making Strides Against Breast Cancer by sponsoring a walking team and raising considerable contributions for the cause. This year, again, they are Gold Sponsors and have pledged a $10,000.00 donation from the firm. In addition to that contribution, the firm's team of staff, family and friends have raised additional donations totaling nearly $11,000.00 making this their most successful fundraising effort yet! To help the firm exceed its fundraising goal and fight breast cancer, visit the website. At the site, readers can make a pledge, join the team or simply find out more about the Making Strides Against Breast Cancer Walk in Florida. As a prominent personal injury law firm in Florida, Politis & Matovina have used their status to focus attention on the hopes and hurdles that exist within breast cancer research. Though the disease still afflicts millions of families and cannot be cured, great progress has been made in research and treatment. Prevention, early detection through mammograms and self-exams and effective treatment are all more possible today than ever before. But the fight must continue. Politis & Matovina have taken a leading role in the Volusia/Flagler event because they know that this charity has changed lives throughout Florida. Furthermore, there are few families that have not confronted breast cancer. No one is immune. Such truth inspires the firm to do all it can to promote awareness. The firm’s partners—Michael Politis and Mark Matovina—have given several speeches prior to the start of the walk over the years. In these speeches, they have made an impassioned and personal argument for why this charity is so important. In his first speech before the walk, Politis affirmed the reasons why he is so committed: “Not only am I so blessed to be married to the most beautiful, loving, generous woman in the world – but I have two beautiful, incredible daughters. God willing, I may someday also have granddaughters. I cannot imagine, and don’t want to even think of the possibility of someone I love suffering or dying as a result of breast cancer.” Because of charity events like Making Strides Against Breast Cancer, fewer people may have to confront the unthinkable. As it has always been, early detection and prevention are crucial. One of the goals of the walk has been to raise awareness for prevention and early detection. The efforts work but they are far from over. Making Strides Against Breast Cancer was started in Boston nearly thirty years ago by cancer survivor Margery Gould Rath. The purpose: focus attention on the fight against cancer and increase opportunities for community involvement in that fight. By 1993, the American Cancer Society Making Strides Against Breast Cancer was attracting 4,000 participants and had spread from Boston to Manchester, New Hampshire. Now, up to 8 million people participate in Making Strides events across the nation during October. As a result of these efforts—and many others—breast cancer awareness is higher than ever. The Volusia/Flagler walk is one of more than 270 such events in the United States held during breast cancer awareness month. The American Cancer Society reports that more than $460 million has been raised to fight breast cancer since the inaugural event in 1984 as a direct result of the walk (http://makingstrides.acsevents.org/). With individuals, organizations, businesses, and law firms like Politis & Matovina doing their part, millions more will be raised this year. In addition to seeking contributions from area businesses, the law firm encourages all employees to raise $100.00 on their own from family and friends. Though $100 is the goal and most employees reach this level, all donations help. Furthermore, the staff of Politis & Matovina all participate in the event one way or another - whether it be by helping out at the Politis & Matovina visitor’s tent, walking on the team, or wearing their “pink bras.” If such passionate effort continues in the fight against breast cancer, perhaps the fight can finally end. Until then, we must all walk on. To learn more, to pledge, and to create or join a team, visit http://www.PutOnYourPinkBra.com.